Music therapy is the planned use of music to assist in the healing and growth of people with emotional, intellectual, physical or social challenges. Music therapy at Raukatauri is delivered by our Registered Music Therapists via a clinical practice rooted in the humanistic model of music therapy which recognizes each individual’s uniqueness and worth. An inborn responsiveness to music exists regardless of disability, injury, illness or environment and is not dependent on musical training or background. Music therapy does not require special skills or talent, and our team doesn’t expect clients to play, sing or behave in any certain way. Our services focus on the client’s strengths, creating an engaging and motivating environment in which children and adults can learn and grow. 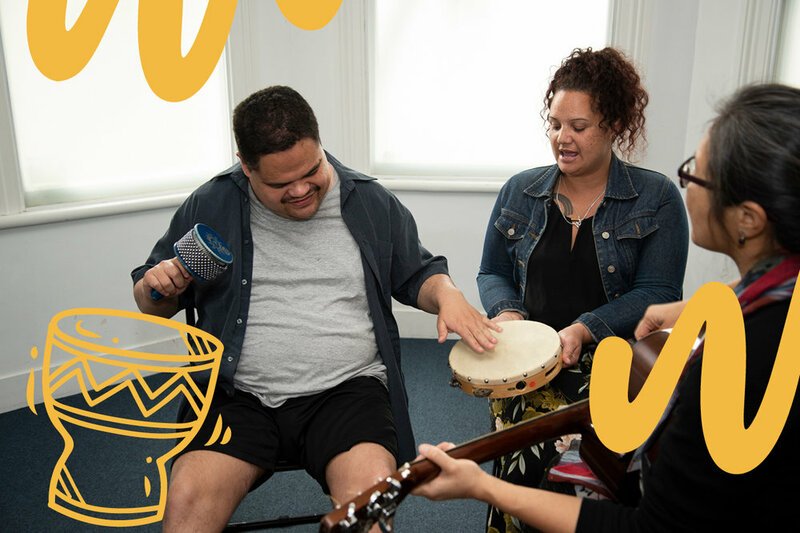 Our strengths-based approach also makes music therapy a positive experience for parents and caregivers, as it allows them to celebrate what their family member is capable of, rather than being reminded of his or her challenges. In music therapy sessions, each person actively engages with a Registered Music Therapist through music improvised uniquely with them, as well as through favourite songs and musical activities. Clients interact and communicate with their therapist, expressing their personalities, ideas and emotions in whatever musical way they can – through instruments, voice and movement. Some sessions are playful and exuberant, others joyful and dynamic, and some others introspective and thoughtful. All are expressive of the individual, empowered by his or her relationship with the therapist and focused on achieving the goals that have been developed in collaboration with the family.